Shepard Fairey (Obey) Locked up!! Shepard Fairey, Andre the Giant, Obey, 38, was arrested on his way to the Institute of Contemporary Art for a kickoff event for his first solo exhibition, called "Supply and Demand." Two warrants were issued for Shepard on Jan. 24 after police determined he'd tagged property in two locations with graffiti based on the Andre the Giant street art campaign from his early career. Shepard has spent the last two weeks in the Boston area installing the ICA exhibit and creating outdoor art, including a 20-by-50 foot banner on the side of City Hall, according to a statement issued Saturday by the museum. The museum said Shepard Fairey was released a few hours after his arrest, but authorities did not immediately confirm that. 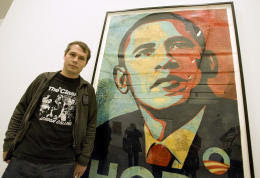 Shepard Fairey's Obama image has been sold on hundreds of thousands of stickers and posters, and was unveiled at the National Portrait Gallery in Washington before Obama's inauguration. The image is the subject of a copyright dispute with The Associated Press. Shepard argues his use of the AP photo is protected by "fair use," which allows exceptions to copyright laws based on, among other factors, how much of the original is used, what the new work is used for and how the original is affected by the new work. Ever waited for a bus?